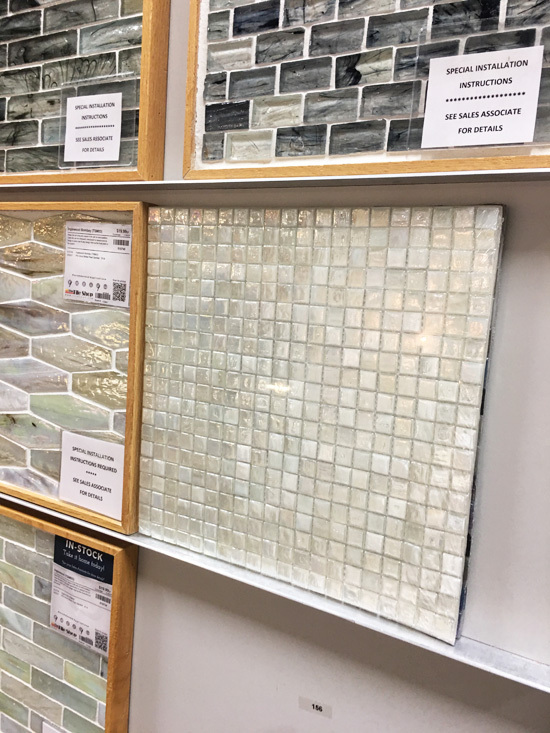 Okay ya’ll, ready to see the tile I chose?? 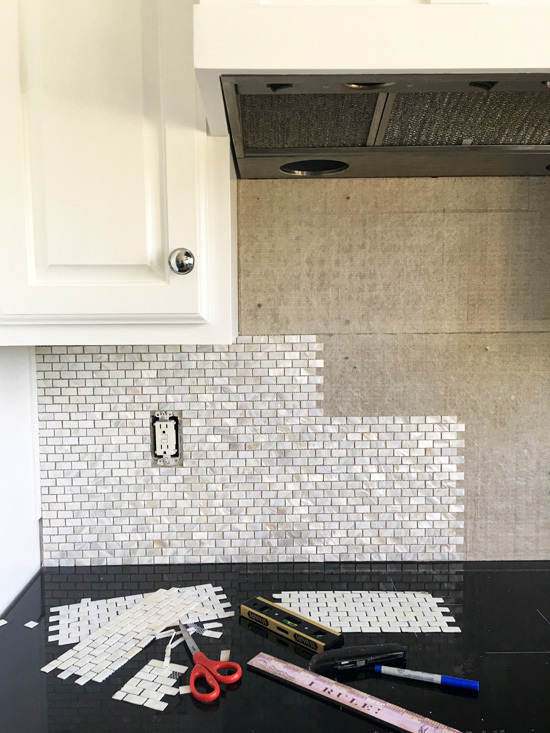 I am so excited to share the backsplash that I just couldn’t wait any longer! It is actually almost finished, but today I am just going to share a few photos I snapped with my phone as it was going up. I’ll save the grouted version for the big reveal! I had not a single idea of what I wanted when I started looking. On a trip to our local tile shop, I found that I was attracted to ALL THE SHINY THINGS. I’ve included affiliate links so you can find the products I love. I bought a sample and brought it home, but it was $19.99 a square foot which is really expensive and when the light hit it, it reflected lots of purple and pink tones. That was not the look I was going for, plus I didn’t love the tiny squares. This is mother-of-pearl and I loved the classic brick pattern. Plus it was half the price of the first tile I purchased. No brainer! It comes in a pack of six 12×12 pieces so I bought one pack to see how I liked it, and I knew right away we had a winner! It has all the pretty neutral tones that I love, but has some sparkle too! I used a product called Simple Mat (in case you’re wondering where the mortar is) to adhere the tile to the wall. The tile is pretty thin since it is real mother of pearl and I was afraid that mortar would ooze out and make a mess. Bling bling! I love how it reflects light. And the mother-of-pearl works perfectly with my love for all things coastal. It will have a totally different look when it gets grouted so it will still make for a fun reveal. Okay so there’s your sneak peek! What do you think?? I’ll be back for Trash-to-Treasure Tuesday sharing our barstools (not really trash) unless I can find something cute to make out of the cabinet doors that were above the stove (trash! )…maybe a cute sign for above the stove? We are heading out of town for the weekend for some waterpark fun so we will have to see what I get done before then! UPDATE: Check out how our stools turned out HERE! I love it. It is so pretty and the sparkle is great. You sure have great taste. That tile is so gorgeous, I love bling too! Good choice, cannot wait to see the final reveal. You go girl! Wow those are lovely! You picked right for your kitchen. I love the look. Looking forward to seeing it with grout. You have fun and relax, you have earned it. 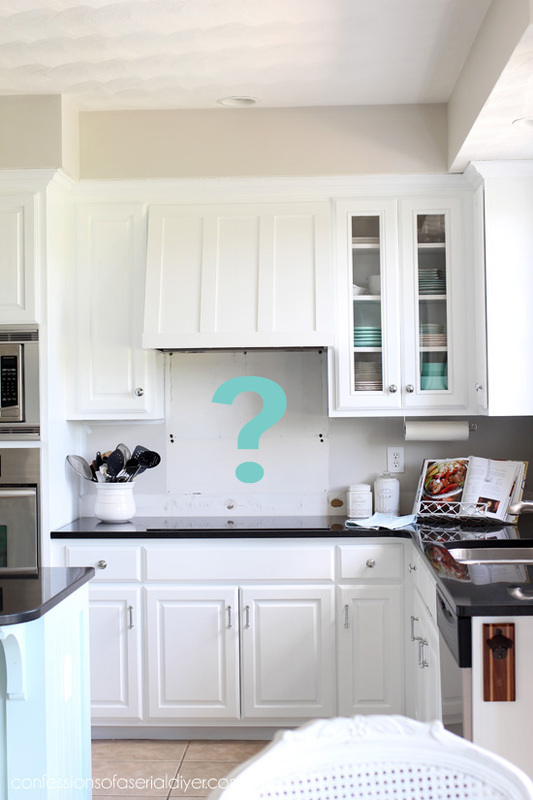 Okay maybe more than one word — your backsplash is going to be beautiful when finished. And you are so right, after grouted it takes on yet another look. Great selection. The mother of pearl is PERFECT!!!! I’m in love with it! Can’t wait for the big reveal! Just completes your space perfectly! Whoohoo! Love the mother of pearl. Different but still has classic looks. color and style of your tile. Have a great weekend. I’ve never seen real mother of pearl tiles! These are beautiful, Christy, and add just the right amount of sparkle. The kitchen is so lovely, in such a short time. It’s like your own One Room Challenge! Simply gorgeous. I never thought of looking for tiles on Amazon, great idea. We bought all of our acid stain for our basement on there though. Wow, what a great choice! I luv it! I’m looking forward to seeing the finished product. Pretty, your kitchen is turning out soooooooooo nice. 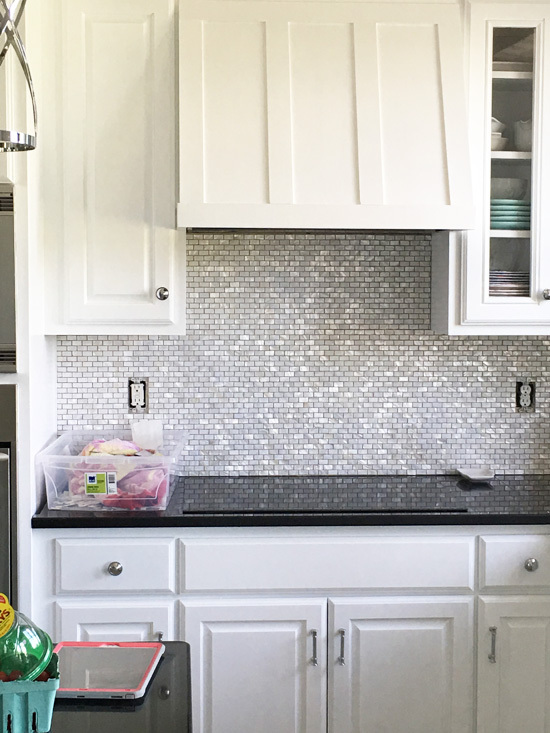 My daughter has the same back splash and it is just so beautiful. Pictures look good, but to see it in person it’s so much prettier. I just love what you have done, great job! I think it looks marvelous! That is both beautiful and perfect for you! Can’t wait to see the finished look. Christy…love the tile you chose and I’m looking forward to the whole reveal. You always come up with great ideas. You have excellent taste. I love the mother-of-pearl tile. What a woman! Hi There, I’ve included hints for your installation. I would definitely use a sealant since the installation is over the stovetop. Grease and food splatters will not stain when they occur (pasta sauce???). Plus the myriad of grout lines will also be sealed. Otherwise, it is a real eye catcher. Such wonderful shimmer!!! Isn’t Amazon great! Whenever I’m looking for something and I can’t seem to find what I want I head to Amazon! Good choice, it looks like the perfect compliment to your new kitchen. Enjoy your weekend! I like it. The small tile gives it a texture which contrasts nicely with the smooth texture of your countertop. A winner in my humble opinion. 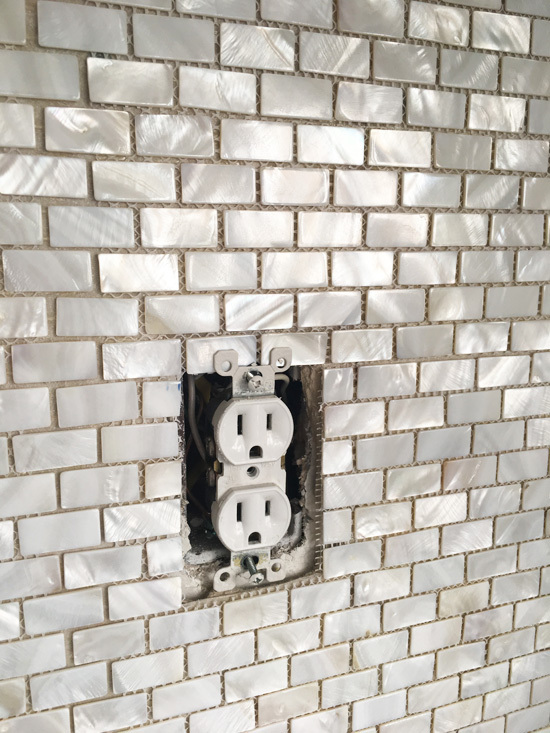 Love your tile choice! It’s perfect! Did you find it difficult to install? Your kitchen is beautiful. Thx for sharing. I like the tile! It’s pretty! Oh perfect! So glad you shared a sneak peek! I love the one in the second row to the left as so unique a shape! WOW!!! and it’s not even finished. It is the perfect blend to the black counter tops!!! Pulls it all together and makes the black not seem harsh. I bet you are happy you kept those countertops now!!!! I was sensing you were not favoring them….but…..they are perfect now!!! Are they granite? Quartz? I think it all looks like it was meant to be!!!! Probably my favorite backsplash EVER. Beautiful choice for tile! I love it! It ties in perfectly with the kitchen and with the house. The kitchen will be amazing when done! So gorgeous Christy! I didn’t know there was a mother of pearl tile. You taught me something new. Can’t wait to see it with the grout. Know it’s going to look amazing! Perfect!! I’m so glad you found that! 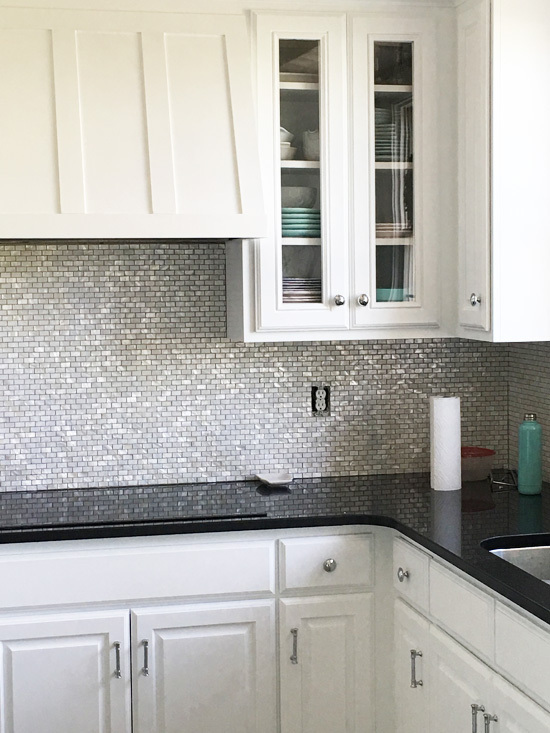 Love the back splash tile, it’s very classy looking and goes so well in your kitchen. You can even see a reflection of it in your counter top! Good choice, I’d like to have this myself! It’s very pretty. I wasn’t sure if I would like it at first, but I think it is beautiful! Love it, Christy – it suits you! Looking forward to seeing the finished kitchen – you are amazing:) Enjoy your weekend – you deserve a break! The mother of Pearl is beautiful!! I love it, it’s turned out beautifully. 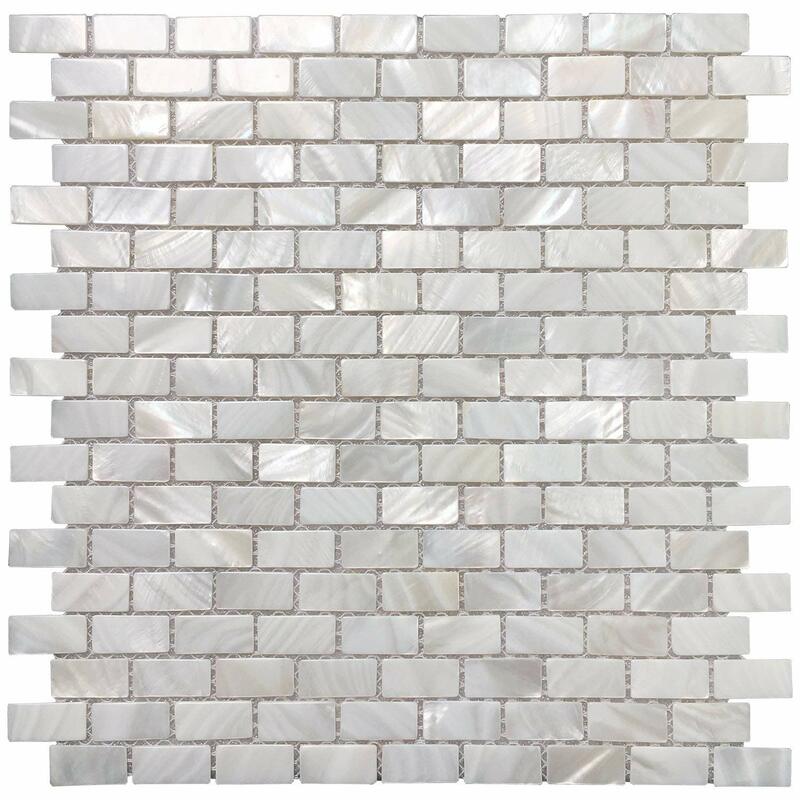 What a gorgeous tile as I love mother of pearl too. It’s looking amazing, Christy! Wow, that is so gorgeous. It will be a real statement in your kitchen and so refined. Who would have thought that you can get tiles on Amazon and MOP tiles at that. Likely not here in Canada, but amazing nonetheless. Can’t wait to see it finished. Pretty tiles! Perfect for your kitchen! Who woulda thought to look on Amazon?